Tecom Investments, a member of Dubai Holding, said it has registered record growth across its business communities for 2014 and is now planning to invest Dh4.5 billion ($1.2 billion) for setting up an innovation hub. The move comes as part of its alignment with Dubai’s National Innovation Strategy. A major operator of Dubai’s leading industry-focused business communities, Tecom said the investment will help fund the creation of Dubai Internet City’s Innovation Hub, which aims to provide 1.6 million sq ft of dedicated space to 15,000 knowledge workers, and Dubai Design District’s pioneering creative community, which will provide a dynamic destination covering one million sq ft for emerging designers, artists, and other creative workers. 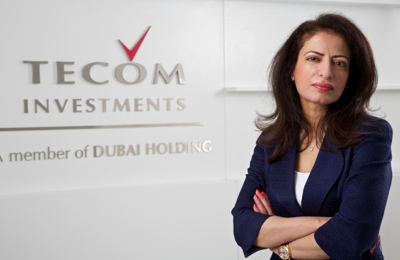 Over the year, Tecom Investments welcomed more than 800 new business partners and enabled 380 expansions across its 11 business communities, said the company in a statement. The positive performance brings the total number of businesses operating to more than 4,650, supporting a workforce of 74,000 across its six industry sectors of ICT, media, education, science, industry, and design, fashion, art and luxury. According to Tecom, the customer loyalty remains high with the company reporting high retention rates of 95 per cent across its business communities. Over 30 per cent of its business partners have been located within Tecom’s communities for a decade or more, and occupancy across Dubai Internet City (DIC), Dubai Media City (DMC) and Dubai Knowledge Village (DKV) remains high at 95 per cent, demonstrating the popularity of these areas, it stated. Commenting on the growth, Group CEO Dr Amina Al Rustamani said: "Our pioneering communities continue to attract new business partners and facilitate expansions, as demonstrated by our strong annual results. Over the course of the year, we introduced several enhancements to our services for the benefit of our business partners, with a view to making running their businesses easier and more efficient." "We also implemented a series of exciting new developments and initiatives that will support future growth and help to drive Dubai’s transition into an innovation-led economy," she noted. “Over the next ten years, we will increase the workforce located in our communities from 74,000 to 100,000, grow our business partner base to 10,000 companies, and provide an additional 10 million sq. ft. of office space, resulting in a total of 16 million sq. ft. of dedicated space across Dubai’s prime business locations,” she added. In direct response to its growing communities and increased market demand, Tecom Investments has announced new developments and the delivery of key projects in 2014, including: The Butterfly, a two tower development located in the heart of Dubai Media City; the DuBiotech Headquarter Building, which comprises commercial space and retail units; and, the Publishing Pavilion and Makateb in International Media Production Zone (IMPZ), said the Dubai Holding company in its statement. As part of its commitment to deliver sustainable, holistic communities, Tecom launched Villa Lantana, a 440-villa residential community located in Al Barsha.